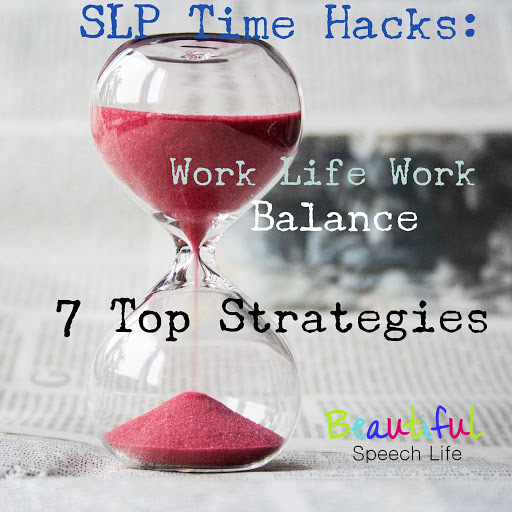 I know a lot of SLP’s that work at their day job, have families and have second jobs as SLP bloggers/TPT sellers. How do we manage big caseloads and endless reports at work and take care of our families and find time to write a blog and create therapy materials? Can I just say I probably have more questions than answers? It can be quite a balancing act with no perfect right answers. These are questions each SLP just has to answer for herself. What I can do is provide some ideas and battle plans that have worked for others. I can get pretty scattered here so I had to choose my top seven. 1. Be crystal clear on your priorities. For me my spiritual foundation comes first, that has to be in place and nurtured for me to be able to give to others. Next is my family, spending time with them and letting them know they are loved is everything to me. The rest is a little harder to separate. Health and fitness. Work. Adventure. Friends. More work. Following my dream. It’s kind of like the Stephen Covey rocks in a jar example: spirituality and family love are the rocks and the rest is the sand. 2. Perfection is the enemy. I really battle with perfectionism. I consciously and daily ask myself “Does it need to be perfect or does it need to be done?” Don’t give me wrong, I have high standards, I just choose my battles. My bed probably doesn’t need to be made perfectly every time, so it’s okay if my husband makes it (haha). Make your list and then write the items down in your calendar. That is how they get done. There is some kind of magic in taking this action. Schedule little chunks of uninterrupted time to write blog articles and create TPT products. If you’re like me, this time is hard to come by. Guard it from the time-wasters. Don’t try to do it all yourself. If you’re working really hard on a deadline, ask your husband to make dinner or get takeout. Hire a housekeeper. I did that last year and it has been one of the nicest things I have ever done for myself. If you are stumped with a problem at work, reach out to your SLP colleagues. There are some really supportive Facebook groups link here and SLP Instagram community is very supportive as well. Click here to read my post about Facebook groups. Do you always do laundry, groceries and errands on the weekend? What about throwing in one load on Tuesday night when you have an hour to blog? Try online order and delivery. I used Prime Now for the first time this weekend and saved myself three trips and probably an hour of time for a seven dollar delivery fee. 6. Use social media-don’t let it use you. 7. Take care of yourself! If you don’t do it no one else will. Save some time just for you. I know this is probably the hardest one but it’s the most important. You have to fill the well. Write it down, negotiate it with your people, beg borrow or steal it, but do it. Give yourself that time to dream, reflect and just be. These are my tips gleaned from wise friends, life experience and countless books. Take what resonates for you and leave the rest behind. And from the bottom of my heart kudos to all of you for having the desire and determination to push through boundaries and follow your dreams..
P.S. Did you like this post? If you did sign up for my email list to be the first to know about new products, freebies and sales. Also follow me on TpT to receive exclusive monthly freebies only available to TPT followers. Thank you for the great article! I think it is really easy to tip out of balanc and I appreciate your thoughts. The more I work on better habits the more I can see things lining up to a more manageable life. For me the critical element is ASKING FOR HELP…and saying NO. Both are really hard for me as I like for people to be happy but I am not happy if I don’t ! Again, thanks for a great article! Thank YOU Amy. I agree, it can be so hard to say “no”, but practice makes perfect, right? I thinks so too Annie, I always love your posts!